Natalia graduated from Ryerson University in 2007 and built a successful carrier in accounting and bookkeeping. 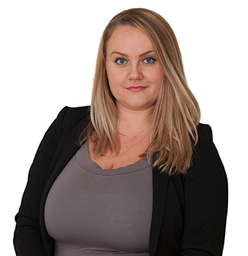 Natalia joined Clarke Law in February of 2010 as a bookkeeper. She went on to obtain her Law Clerk diploma and Paralegal License in 2012. Natalia performs an integral role at the firm by keeping track of all outgoing and ingoing expenses of the clients. The firm pays for all of those expenses out of their own funds and firm’s fanatical stability depends to a great degree on Natalia’s proper record keeping and prompt processing. Thousands of expenses (disbursements) are paid out by the firm in any given year. Through the contingency fee system endorsed by the Law Society of Upper Canada, all of clients’ legal fees and disbursements are deferred until the case is successfully resolved through a mediation or trial. By deferring their fees and making them contingent upon the success of the client’s case, Clarke Law is invested in moving the case along in a timely fashion. The firm does not collect their legal fees until an actual result is obtained. Clarke lawyers vigorously protect each client’s legal rights and carry each case to the utmost successful result it can possibly achieve. Natalia is instrumental in making sure that the firm has the finances to pay for the disbursements to obtain variety of records such as police motor vehicle reports, ambulance records, hospital records, family doctor records, rehabilitation clinic records, specialists records, outpatient clients’ records, surgery records, medical procedures records, radiological records, employment file records, Revenue Canada records, OHIP summary records, school or university records, and any other record necessary to prove client’s case. In addition to paying for the records, the firm pays into court for issuing Statement of Claim, for Jury Notice, Statement of Claim Levy, process server to file claims in courts, process server to serve the Statement of Claim on the defendant, process server to search for and secure the service on the defendant, and this is before any expert is retained. The viability of the firm and its ability to finance our client’s access to justice, access to courts and access to proper compensation depend on the financial soundness and accountability of the firm carried out by Natalia on a daily basis.